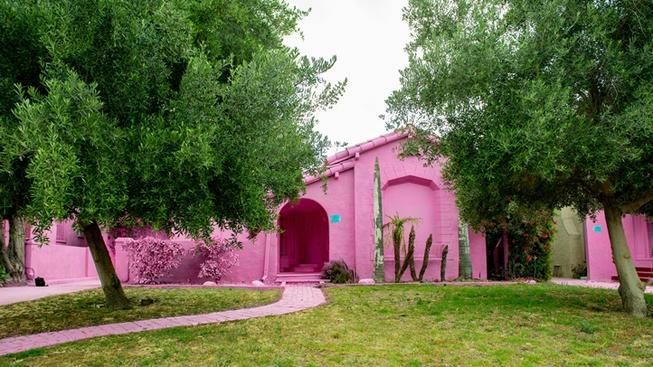 Three Mid City houses have been painted hot pink by a local artist who goes by the name, The Most Famous Artist. The ephemeral and extremely Instagram-friendly art project was done in anticipation of their demolition, with the homes set to make way for a 45-unit apartment complex. Until then, they’re a very bright pink that tips its palette to Christo’s large-scale public color works, Louise Nevelson’s monumental sculptures, the Dada art movement and Julian Schnabel’s pink building in the West Village. Our latest project with @themostfamousartist at 1500 Hi Point Street in LA. Despite those intentions, many Mid City neighbours are not pleased. Brad Kane, president of the Pico Neighborhood Council, said the project was undertaken without notifying any of the nearby residents. Repainting is expected to happen this week after Laura Anderson of the Faircrest Heights Neighborhood Association reached out to M-Rad asking for the houses to be painted a more subdued color. Such is the nature of ephemeral art, you’ll need to enjoy this piece while you can.